This year's teacher for Quilt Til U Wilt is Denice Heitkamp. She will be teaching us how to make baskets, microwave bowls, table toppers, trivets, keychains & totes from clothesline. 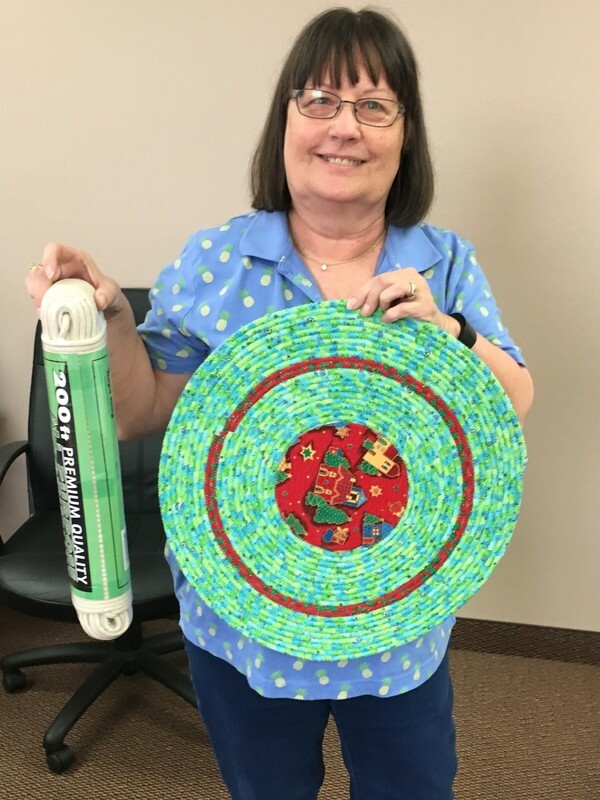 Denice has been a member of DQN, Green Valley Quilters and Loose Threads Circles for almost 5 years. She has made many quilts & quilted projects over the past 30 + years & always has scraps! Well, the scrap piles became so large she needed to find something to do with them (can’t throw away anything). About 10 years ago, she saw a book at a quilt show with baskets on it and decided “I can do that” & read the book! After many hours of trial & error at the sewing machine, she found a system that works for her. Now she is ready to share it with us in this fun day in July. Every basket, table topper, key chain & dog bed brings new possibilities & that is what makes it so much fun to complete. Experimenting at every stage of the construction of a basket will give you so many different results such that no 2 are alike; the ideas & changes just keep coming. Denice will be sharing her experiences throughout the day. The fun in making them is seeing what is completed in the end and the many uses that will require another clothesline project. She will start with the basics -- wrapping your clothesline with fabric, starting to stitch, shaping -- and then will demonstrate how to make many different projects using these techniques. Her Mandatory Supply Kit will include the required items to make a bowl -- $7.00. These items can be made with or without fabric. The example pictured here was made from unwrapped clothesline using variegated thread to provide some color. No Pot Luck this year -- we will be ordering lunch from our caterers or you may bring your own.